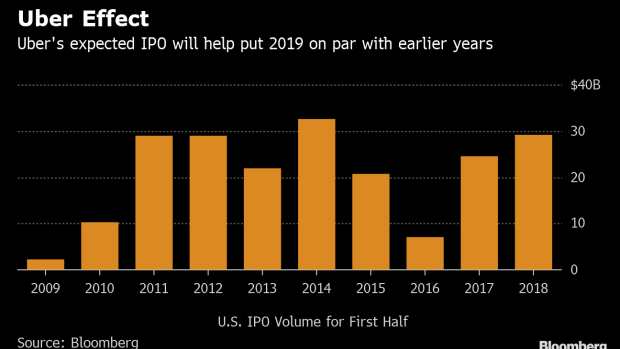 (Bloomberg) -- Uber Technologies Inc.’s plan to go public could rescue 2019 from a disappointing first quarter for U.S. initial public offerings. The world’s biggest ride-hailing business is planning to file publicly in April for an IPO, said people familiar with the matter who asked not to be identified because it was private. That would set up a share sale before the end of June. People familiar with the matter have said the company could be valued at as much as $120 billion. Even if Uber floats only 8 percent of its shares at that valuation, it would raise more than $10 billion in fresh capital. Uber’s offering alone would eclipse the 21 U.S. IPOs that have raised $1.6 billion so far in the first quarter, which has been the worst since 2016. It would also likely lift the year’s first half above the $7.12 billion in share sales for the first six months of 2016. For perspective, one has to go back to the financial crisis in 2009 to find a worse first half. Uber will likely be following its smaller rival, Lyft Inc., whose IPO could this month or next. Lyft is seeking to be valued at $20 billion to $25 billion, people familiar its plans have said.